The Pacific Mini Games has been underway for just six days and already the host nation has hit a high. Vanuatu secured its sixth gold medal of the Games on Saturday morning in the final of the tennis Men’s teams event surpassing the previous highest total for the nation of five gold. President of the Vanuatu Tennis Federation, CyrilleMainguy could not have been prouder of the performance on court this morning. “We made history – it’s the first gold medal for Tennis in any Pacific Games,” he said. Following a win and a loss in the singles element of the event on Friday, it all rested on the outcome of the doubles and the Vanuatu team of CyrilJacobe and Aymeric Mara played well, ending with a decisive score of 6-2,6-2 in a dominant performance over Fiji. Mainguy is also the Secretary General of VASANOC and the importance of breaking this record has not been lost on him. “For Team Vanuatu it is super special because we’ve never had more than five gold medals so this is our sixth gold medal and I am so proud that tennis is the sport that brings that gold medal to Team Vanuatu – and it’s only the end of the first week,” he said. 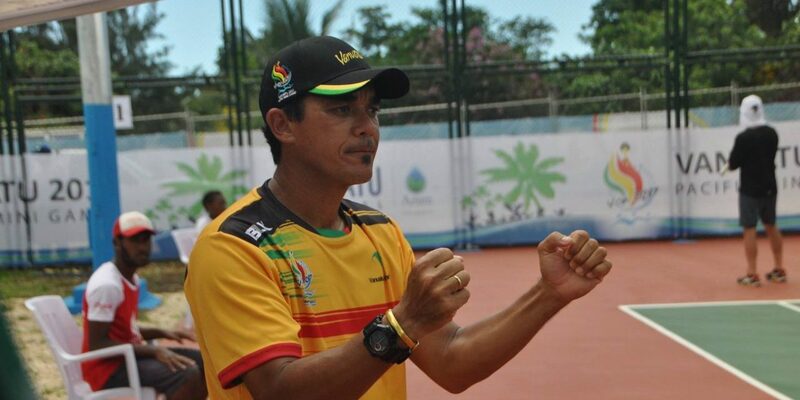 Despite the gold medal success coming from the racquets ofJacobe and Mara, Mainguy is quick to point out that this was a team event and therefore credit should go to all five players for Vanuatu – Jacobe, Mara, Clement Mainguy, Lorenzo Pineda and Leniker Thomas. “It’s a Teams event, we have five players and they all played,” he said.